Daal refers to an entire category of legumes which includes many sizes and colors of lentils and split peas. 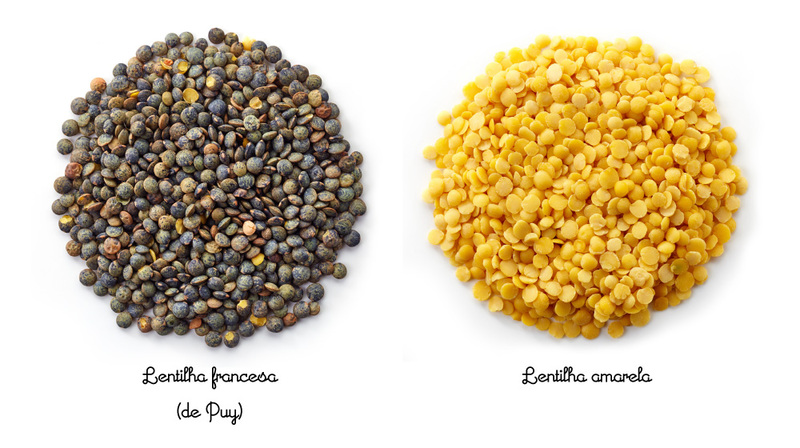 Tiny yellow lentils, which are different from split peas, are the most common variety used for Afghan daal. Don’t fret, you can substitute any kind of lentil from your cupboard—green, red or even split peas—for this recipe. Regardless of the variety, all these legumes are incredibly cheap, easy to prepare, around 15 - 20 minutes, and packed with nutrients. Afghan daal is a little thicker and less soupy than Indian daal. It's typically served with nan/bread or Afghan challaw (white rice). I like mine with a dollop of garlicky yogurt. 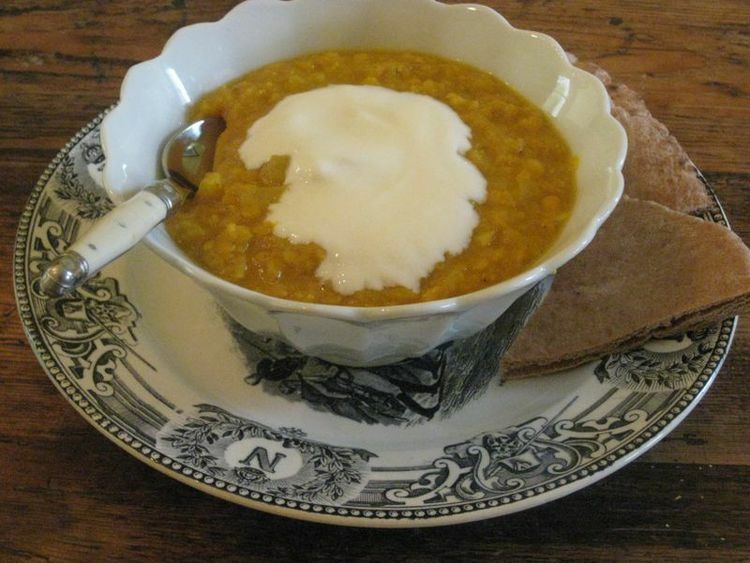 Here is a recipe for daal made with plenty of onions and garlic, fresh ginger, a touch of cumin and cayenne pepper. I've also added a teaspoon of turmeric which brightens up the color and adds the wholesome goodness of the spice. You can make a large batch and take the left overs for lunch the next day. Heat the olive oil over medium-low heat in a medium sauce pan. Add the onion, garlic and ginger and saute for about 5 minutes until the onion is translucent. Add the turmeric, cumin, cayenne, lentils and broth, stir and turn the heat up to high. When the liquid boils, turn the heat down to a simmer, cover and cook until the lentils are very tender, about 15 minutes. Remove from heat and add the lemon juice and salt. Serve with a spoonful of plain yogurt and warm pita or nan bread. Winter is the time to have lazy Sunday mornings and family gatherings over brunch. Kuku is Afghanistan’s answer to the Spanish tortilla and the Italian frittata. Eggs are beaten, mixed with vegetables and cooked either on the stove top or in the oven, or a combination of the two, until the eggs are just tender. Seasoned Afghan cooks prepare the dish entirely on the stovetop, flipping it part way through. However, this can be tricky. The method my friend and food blogger Katie Morford Sullivan is a bit more forgiving. The seasonings for kuku are distinctively Afghan. This particularly dish is flavored with an abundance of cilantro and turmeric, along with potato, spinach and scallions. The result is a brightly colored and boldly flavored egg dish suitable for a brunch or lunch or light supper. It can certainly hold its own against even the best from Spain and Italy. Immerse the potato in a small pot of cold, salty water.Bring to a boil and cook until tender. Drain and mash with a fork. Turn your oven on to broil. 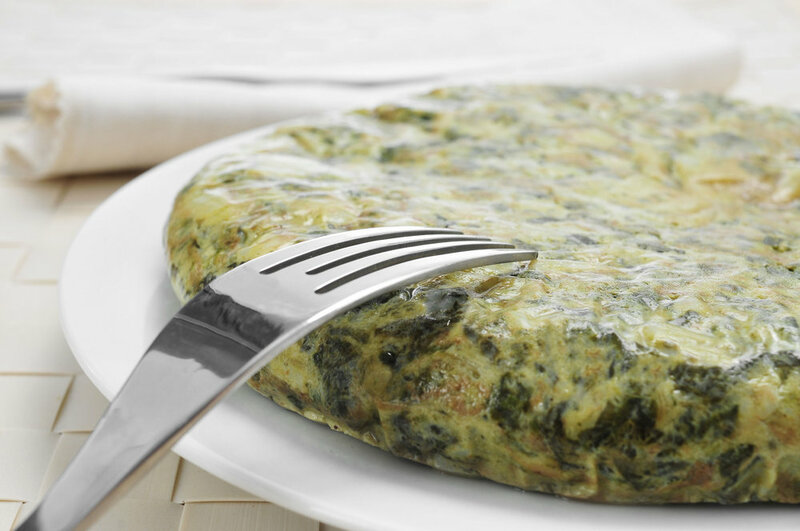 Crack the eggs into a medium bowl and beat them with a whisk.Be sure the herbs, scallions and spinach are thoroughly dry (a salad spinner can help with this).Add the mashed potato, cilantro, scallions, spinach, jalapeño, turmeric, salt and pepper to the eggs and whip until combined. Drizzle the olive oil in a 10-inch, non-stick skillet and set over medium heat. Add the egg mixture and cook for 6 to 8 minutes until the outside browns lightly and the eggs begins to set in the middle.It will still be quite runny across the top. 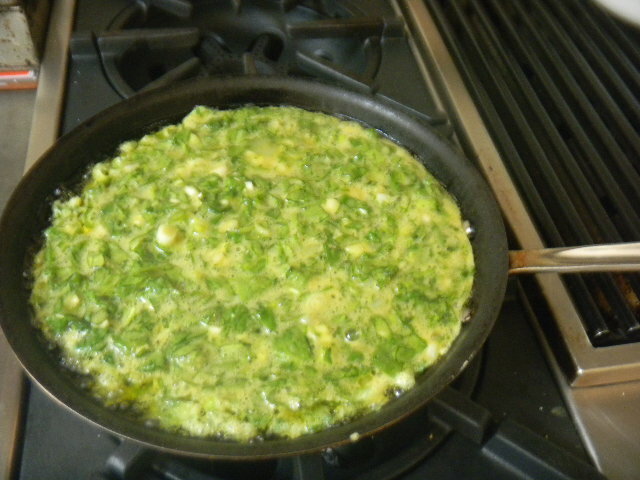 Set the skillet under the broiler until the eggs are firm, though still tender.Remove the skillet and allow it to cool for a few minutes.You can cut wedges directly from the pan or run a knife around the edge, put a dinner plate over the top of the skillet and quickly invert the kuku onto the plate.Serve warm or cold. The older I get the more I like my own food. At pot-lucks, I grab a nice plateful of my dish before others get to it. At restaurants I order food with similar spices and flavors. I recently accepted the dark reality that I have become my mother --- when it comes to food. The first time I had Mujaddara, it was love at first bite. It tasted very similar to my favorite Afghan dish Shohla but not as filling. I recently sought a recipe for this dish popular in Arab countries and settled on a recipe from the Food Network since I had the ingredients in my pantry. To my children's annoyance, I have made this dish every week in the past month to perfect the recipe to my taste, my waist line and to my kid's palette. Mujaddara means pock-marked in Arabic, referring to the the black or green lentils mixed in with rice, onions, coriander and cumin. I have to admit, I did make the dish with Trader Joe's steamed lentils which turned out fabulous and it cut the cooking time in half. However, in this recipe I use dry green lentils so those who are not near a TJ's can still make the dish. May the cooking fairies make your Thanksgiving day a fabulous one. This year I give thanks for my family, for my health and for my community (that includes all of you). I also remember my father Ghulam Farouq Ghilzai, who celebrated Thanksgiving with great enthusiasm every year since it was his favorite American holiday. He always reminded us to be thankful for living in this fabulous country, the United States. In a pan, add lentils and cold water. On high heat, bring to a boil, then reduce to simmer. Cook until lentils are soft, around 15-20 minutes. Don't over cook the lentils since they will simmer with the rice. While the lentils are cooking, place a deep frying pan on high heat and add olive oil. After a minute, add cumin seeds and stir until the seeds turn slightly brown and fragrant, around 2 minutes. Add the onions to the pan and reduce heat to medium high. Stir frequently, cook the onions until slightly brown and crispy, around 15 minutes. Scoop out a quarter of the caramlized onions onto a plate to use as granish later. Add the rice to the pan, stir consistently so it doesn't stick to the pan or break. Once the rice is translucent, around 3-4 minutes, add the cooked lentils, the spices, salt, pepper and the water to the pan. Stir well and bring to a boil. Turn down the heat to low, place a lid on the pan, let the ingredients simmer until the rice is cooked through and all the liquid is absorbed, 20-30 minutes. Remove the pot from heat, let is sit for an additional five minutes before serving. Serve the dish on a bed of lettuce, topped with the carmalized onions, a wedge of lemon or a dollup of plain yogurt.